COIN’s second album is a familiar pop series that embodies a mixed bag of emotions, all with a stagnant and cheerful disposition. COIN is leading a front in the independent pop artist game. 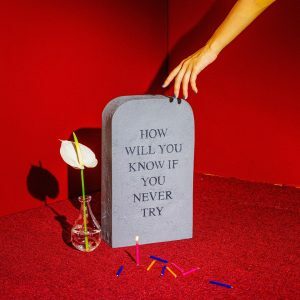 Their newest album, How Will You Know If You Never Try (2017) also known as HWYKIYNT, came out this past Friday, April 21. With leading singles “Talk Too Much” and more recently “I Don’t Wanna Dance”, they leave indie pop fans vacating all music elsewhere and directing themselves to the album. Their second album is a familiar pop series that embodies a mixed bag of emotions, all with a stagnant and cheerful disposition. Two years after the release of COIN (2015), featuring some prominent go-to pop singles like “Run” and “Atlas”, the new album shows the very development and confidence of the band. The Nashville band takes their dreamy vocals, pumping drums, and wildly smooth guitar riffs up a notch. Their lyrical growth and outreach of emotions makes the listening experience a familiar yet enjoyable one. COIN’s album starts with an empty and slow introduction “when I talk about the future.” They quickly adjust their momentum and bring back their usual windy drums and pushy beat. Chase Lawrence, the lead vocalist, assures his Nashville heritage by mixing his vocal twang with jumpy indie pop instrumentals. It is rather reminiscent of indie artists who share optimism in their tracks, like Magic Man, LANY, The 1975, Grouplove, and Smallpools. Following songs have a similar format, each containing relatable story, undeniable cheer, and riffs true to the band. “Talk Too Much” is the third song off the album, and it is the talk of the town; this anthem emulates the insecurities of many individuals in a cute and honest approach. Their fourth song “I Don’t Wanna Dance” also has a similar message, validating the goodness of the song through irony, in a way. COIN’s album holds a theme: challenging the realities of teenage/young adult love and relationships. With relationships comes insecurities, blunt conversation, and of course, courtship. Their lyrics prove this. In their sixth song “Are We Alone?”, parts of the script add to the very emotion that comes with young love. “Pulling teeth just to ask how your day was” is one notion which many may relate to. A part of young love, however, comes along innocence and a fresh start. COIN ends their album slow, like the beginning. The last songs “Miranda Beach” and “Malibu 1992” simply add to the narrative, ending in such a way that is filled with nostalgia. Overall, COIN’s HWYKIYNT (2017) is the ultimate go-to summer album to add to any indie pop playlist. Though there is little variety between songs, they still contain positive messages that are relatable on so many levels.